Who doesn't like to get free stuff? Nobody, that's who. Even if you aren't financially challenged, free stuff is just fun to receive. In the first of a series of posts about freebies, I present to you, Smiley360. Smiley360 allows you to try products for free in exchange for your feedback about the product. You fill out questionnaires to qualify for missions, which is what the free item campaigns are called. They use the questions to tailor the missions to you personally. For example, if you inform Smiley360 that you have a dog and a mission comes up for dog treats, you would likely qualify for that mission. Smiley360 launched in 2009 and boasts 900,000 members. Not too shabby right? It's super easy to join and really fun to participate. Plus, did I mention you get free stuff? Another cool feature of Smiley360 is what are called Twitter parties. A twitter party is an event involving Smiley360, a brand and Smiley360 members. A twitter party will have a certain hash tag assigned that allows everyone to keep up with the conversation. There are a series of questions asked and Smiley360 members respond via their tweets. If you RSVP ahead of time you're entered for a chance to win a gift card. During the party gift cards are also given away. I love Twitter parties and attend them whenever I have the opportunity. Smiley360 is very present on social media. You are encouraged to interact and provide feedback online via Twitter, Facebook, ect. 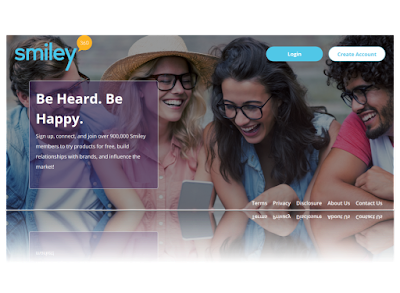 If you're like me and you love to get free stuff and share your opinion, then Smiley360 is definitely worth the click. Check it out here. Are you already a member of Smiley360? If so, let me know how you like it in the comments below. Do you have a favorite freebie site? shout them out! Be sure to follow this blog for future freebie, mommy and make money online posts.